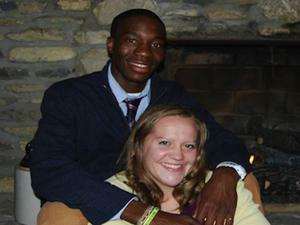 A small Kentucky church has chosen to ban marriages and even some worship services for interracial couples. The Gulnare Freewill Baptist Church, located in Pike County, made the vote in response to a longtime member who is engaged to a man whose birthplace is in Zimbabwe. Other pastoral leaders in the area were quick to denounce the church's vote. "It's not the spirit of the community in any way, shape or form," Randy Johnson, president of the Pike County Ministerial Association, told the Lexington Herald-Leader. The small congregation, which usually hosts about 40 members each Sunday, held the vote after longtime member Stella Harville, brought her fiancé Ticha Chikuni to church with her in June. The couple performed a song together at the church in which Chikuni sang "I Surrender All," while Harville played the piano. Chikuni, 29, who works at Georgetown College, is black--and Harville, who was baptized at the church but is not an active member, is white. Dean Harville, Stella's father, said he was told by the church's former pastor Melvin Thompson that his daughter and her fiancé were not allowed to sing at the church again. However, Thompson recently stepped down and the church's new pastor, Stacy Stepp, said the couple was once again welcome to sing. Stepp's decision prompted Thompson to put forth a recommendation saying that while all members are welcome at the church, it does not "condone" interracial marriage, and that any interracial couples would not be received as members or allowed to participate in worship services. The only exception? Funerals. The Harville family has formally requested the congregation to reconsider the interracial ban, and Thompson has also said he would like to resolve the issue, the area CBS affiliate WYMT has reported. That the Gulnare Freewill Baptist Church does not condone interracial marriage. Parties of such marriages will not be received as members, nor will they be used in worship services and other church functions, with the exception being funerals. All are welcome to our public worship services. This recommendation is not intended to judge the salvation of anyone, but is intended to promote greater unity among the church body and the community we serve. Members of the church held a vote on Thompson's proposed language, with nine voting in favor and six voting against. The other members in attendance chose not to vote. Gawker notes that Pike County is 98 percent white and home to the infamous Hatfield-McCoy feud. The Harville family doesn't see Gulnare's new policy promoting anything like unity or civil peace. "They're the people who are supposed to comfort me in times like these," Stella Harville said. And Stella's father was much more forceful in his denunciation of the interracial ban. "It sure ain't Christian," Dean Harville said. "It ain't nothing but the old devil working."